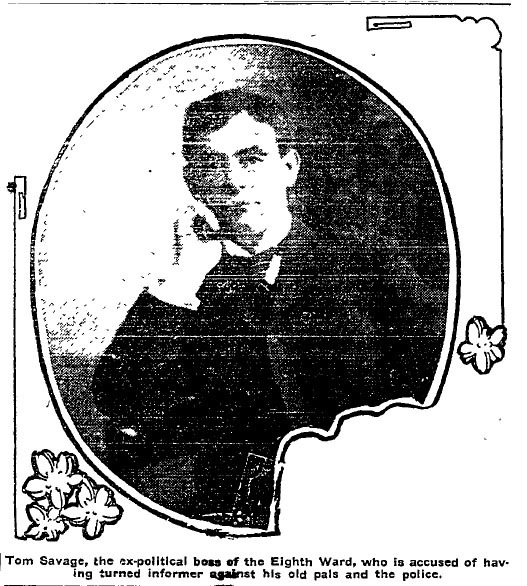 The matter at hand involves Tom Savage, boss of the 8th Ward, known as the “Bloody Eighth,” on charges of running a disorderly house, the Arlington Hotel, in the Tenderloin. Several men were accompanied by their wives and became increasingly nervous during questioning about whether they had ever been to a house a prostitution. “I’ll show you about the city when I get you home,” his wife exclaimed from the back of the courtroom. The jury deadlocked and Savage’s case was dropped. The onetime newspaper pressman, who was elected to the council in 1894, died of a morphine overdose in his room at 111½ Commercial St., in what was then the 8th Ward. The man who once boasted “I’ve got all the votes you need right here in my vest pocket” was 47. The photo was published in the Los Angeles Times. I have no idea where to get another copy of it.